I have just today confirmed an appearance with the Lake County Historical Society at their Artists and Authors event taking place on Saturday, April 28, 2018 from 10-2p. I will have copies of all three of my books available for purchase. This should be a fun event. LCHS has some great volunteers and they usually attract a strong crowd. I missed their recent Museum by Moonlight event but heard it was a fantastic time. The Lake County Historical Society operates the museum in the Lake County Courthouse located on the ground floor at 317 W. Main Street in downtown Tavares. My dear friend Bob Grenier serves as Curator and has done a tremendous job. If you haven’t visited you are missing out. I hope you are able to attend. I will be sharing a table with my good friend Bob Grenier. We will both have multiple history books available for sale and we would love to meet and talk with you. This event will be taking place on Saturday, October 28 from 1p-4p at the Deltona Library; 2150 Eustace Avenue in Deltona. To learn more, visit the Facebook page for this event. Click the link below to view a copy of the event poster. My new book from Arcadia Publishing will be released next week, September 26, 2016! You may order copies at Amazon, Barnes and Noble or other online retailers. If you live in the New Smyrna Beach area please feel free to stop at the New Smyrna Museum of History to purchase a signed copy. Your purchase will benefit the museum. You may also order a signed copy directly from me. Copies directly from me will cost $20 including shipping. Please pay by paypal: Robert at robertreddhistorian dot com. Be sure to let me know which book you are ordering (I have three out now and all cost $20 each), how you would like it signed, and where I am sending it to. In addition, I will be at Renewals: A Bookshop on Friday, October 7 from 11am until 1pm. Stop buy, purchase a book, and browse Debbie’s great shop. Please let me know if you would like to schedule a signing or know of somebody who would. I have two New Smyrna Beach titles and my third book deals with St. Augustine and the Civil War. I would be glad to attend your event! In the mean time, here’s a trailer that Arcadia has put together. Enjoy! I would like to thank the Arthur Erwin Chapter of the Daughters of the American Revolution for their invitation to speak to their group. I will be speaking on New Smyrna Beach history. The meeting will take place on Friday, March 10, 2017 at noon. The meeting will be held at The Cloisters of Deland. Please click the link for details as to location. I will have copies of all three of my books available for purchase. I hope to see you there! My apologies for the lack of posts recently. My book writing has kept me busy as of late. This week I submitted the manuscript and photos for my third book to Arcadia Publishing. 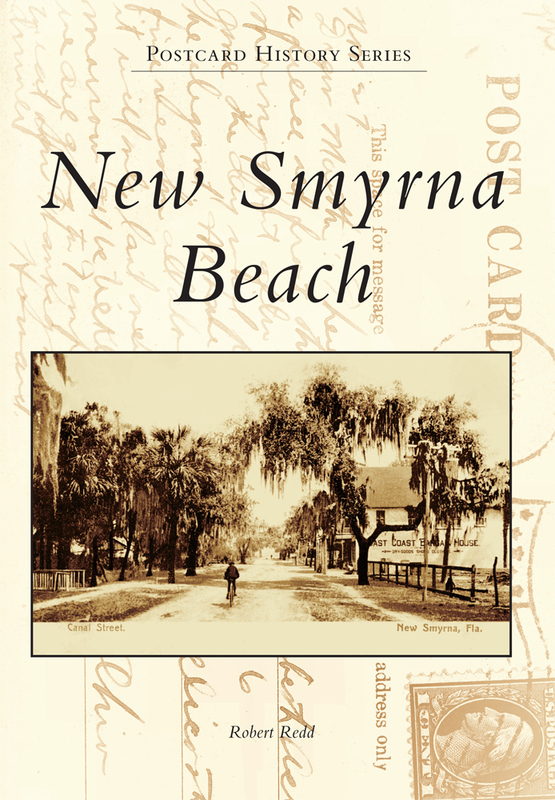 This book will be in their Postcard History series and will cover the city of New Smyrna Beach. I found some great cards and I really think people will enjoy seeing the New Smyrna of yesterday. I don’t have a publication date yet but as soon as I do, I will let you, my readers, know. In addition, I have scheduled a talk on my recent book, Historic Sites and Landmarks of New Smyrna Beach, also published by Arcadia. On Saturday, April 16 at 2pm I will be speaking at Debary Hall as part of their Lemonade Lectures series. If you haven’t visited Debary Hall, you have missed a great trip. I have a conference call scheduled for early next week with acquisitions editors from Arcadia to discuss ideas for my next book. I have put forth several ideas so I am sure we will cover the merits of each, which they find most marketable, and which I prefer to work on. I’m sure the call will be productive.